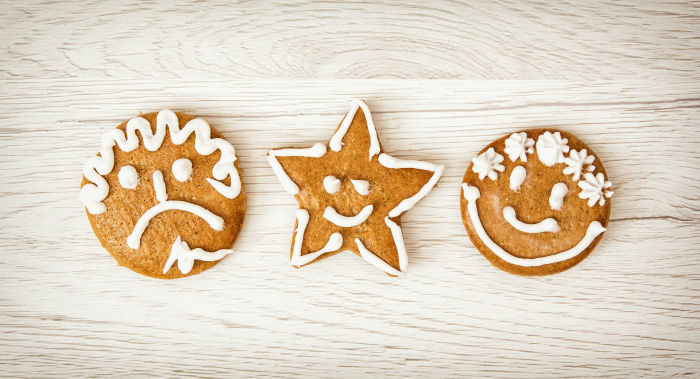 Explore different emotions with a batch of these delicious treats. Cooking is always a great learning opportunity for young children. Helping in the kitchen gives kids hands-on experience with food preparation and provides a wonderful family bonding experience. The holidays, in particular, put a lot of emphasis on the traditions of cooking, baking, and eating together. Use this valuable time to teach your child about your family's holiday food traditions, and allow them to get creative with their own ideas and inspirations. One fun way of doing this is to buy some ready-made refrigerated cookie dough and cookie decorations, and ask your child to make silly face cookies with you. This is also a good way to teach your child about recognizing emotions and facial expressions. Some of the cookie faces you make can be happy, sad, angry, surprised, embarrassed, worried, proud, funny, etc. After you bake the cookies, take turns guessing what the other person's cookie is thinking or feeling, then share the cookies with family, friends, or neighbors. Bake sugar cookies according to the packaging directions. After cooling, decorate the cookies to create a variety of silly expressions. Use toasted coconut for hair, chocolate chips for eyes, gels for mouths, etc. Take turns guessing what the other person's cookie might be thinking or feeling based on its expression. Share your cookies with friends, family, or neighbors.